Rating: 6.9/10. From 168 votes. Wiley Clapp has been writing for the gun press as long as I can remember and is someone everyone in the industry respects. With a background in both the military (he was a Vietnam Marine with combat experience) and law enforcement (he was a deputy in a large California Sheriff’s Office), Clapp knows both combat and competition. But it’s the combat handgun that receives most of his attention. Over the past several years, Clapp has worked with distributors to manufacture classic combat handguns to his specifications. And while you might not agree with his platform, you can’t argue they aren’t well thought out and appointed. His latest collaboration involves the Ruger GP100, one of the best-built and most reliable revolvers on the planet. To create his version of the perfect combat revolver, Clapp teamed with Robert Coyle of Talo, Inc., a distributor known for introducing one-of-a-kind custom handguns. And like his other creations, this pistol offers a number of unique and interesting features. It’s not surprising Clapp chose the GP100 as a basis for his fighting revolver. Launched 25 years ago to replace the Security/Service/Speed Six revolver series, the GP100 was designed to shoot thousands of rounds of full-power .357 Magnum ammunition without the worry of cracked forcing cones, blown topstraps, stretched frames or any other mechanical failures due to prolonged use. All of a GP100’s internal components come out the bottom, meaning there is no sideplate in the frame, thereby increasing the strength and longevity. In addition, the GP100 comes with an excellent trigger action right from the factory. The GP100 Wiley Clapp is an attractive revolver with a heavy matte stainless steel finish with combination rubber/wood insert grips. The rubber frontstrap and backstrap help reduce felt recoil, and the distinctive checkered pattern on the wood side panels coincide with how your fingers engage the grip. The result: a grip both functional and elegant. Another unique feature: Novak Lo-Mount sights. Clapp feels the Novak sight system is among the best combat sights available. If somebody had asked me about placing a Novak sight on a revolver, I would’ve said it would be awkward. But after actually seeing them, I admit they’re quite pleasing to the eye and look very sleek on the GP100. The rear sight is flat black (no dots) and adjustable for windage by loosening the setscrew. The front sight incorporates a large, very visible lime-green fiber optic rod while retaining a square front-sight post configuration. The green rod is visible under a wide range of light environments, catching any available light, and it contrasts nicely with the flat-black rear. I know from past conversations Clapp is a fan of brass-bead front sights, so the use of a fiber-optic sights is very new age indeed. The frame and cylinder are “melted”–i.e., all the sharp edges have been removed. This is critical on a gun you might carry concealed. In fact, a carry bevel package is a good idea on any gun intended for combat because such a handgun will likely be manipulated under duress, and having nothing but smooth surfaces under skin will aid such crisis operation. The cylinder release Ruger places on all its double-action revolvers is the most intuitive in the industry. The push-in release is much easier to operate than a push-forward or pull-back release when digital dexterity is at a minimum, which it will likely be during conflict. The 3″ barrel Clapp incorporated in his design is just about perfect because it’s long enough for modern ammunition to build proper velocity, provide complete case extraction and remain fast from the holster. In the mid-1980s, the FBI issued a 3″ revolver after exhaustive testing and had great success with the gun right up until semiauto pistols became the norm for American law enforcement. Just because times have changed doesn’t mean the past is wrong. The smooth trigger with its slight radius proved very comfortable and easy to depress straight to the rear. Revolver triggers have long travel lengths compared to semiautos, so having a trigger profile that permits proper finger placement provides a real advantage, both physiologically and mechanically. With a revolver, your trigger finger actually extends slightly downward when gripping the gun high on the backstrap. If the trigger isn’t properly shaped and contoured, double-action trigger manipulation proves difficult at best. Considering .25″ of muzzle movement translated to a 4.5″ miss at 20 feet, a smooth trigger pull is essential. The GP100 Wiley Clapp trigger is properly designed and was attached to a double-action trigger that broke my scale right at 9 lbs. The single-action trigger broke at 4 lbs. with a very nice release. I could lie and say the test was a snap, but in truth it became brutal toward the end. Shooting 125 rounds of full-power .357 Magnum ammunition will get your attention and make your shooting hand throb a bit. Thankfully, the rubber grips really do help tame the recoil. I would’ve hated performing the test with wood stocks. I fired the excellent Federal 110-grain +P+ Treasury load (a .38 Special round) for the final 25 rounds. This load was developed especially for Treasury Department agents carrying the 2.5″ Smith & Wesson Model 19 revolver, and it’s an outstanding performer in a snubby. The GP100 Wiley Clapp is beefy, so I would certainly carry full-power ammunition, and certainly practice with the same sometimes. Not always, however, due to cost and comfort. I continued testing by adding a Bianchi belt holster and shooting some of my typical practice drills. Unlike some of my contemporaries, I don’t make the transition from pistol to revolver easily, so I must spend a bit of time getting used to the different grip angle and feel, longer trigger and taller weapon. Truth be told, it took some dry fire and 200 rounds of 158-grain semi-wadcutter .38s to get the feel of the GP100, but once I did it felt like an old friend. The fiber-optic Novak sights were a real asset when trying to shoot fast (which will be the case when fighting for your life). The cylinder broke open smoothly when attempting a speed load, and the large cut placed in the left side of the grip made speedloader insertion easy and allowed them to fall cleanly. When shooting the El Presidente Drill, it’s hard not to notice how much longer it takes to reload than it does a semiauto, but it’s also hard not to notice how fast you can shoot due to the heavy all-steel frame helping keep the muzzle on target. Sure, the trigger is long, but it’s smooth, so you can depress and release it quickly, making the GP100 Wiley Clapp a very fast shooter. 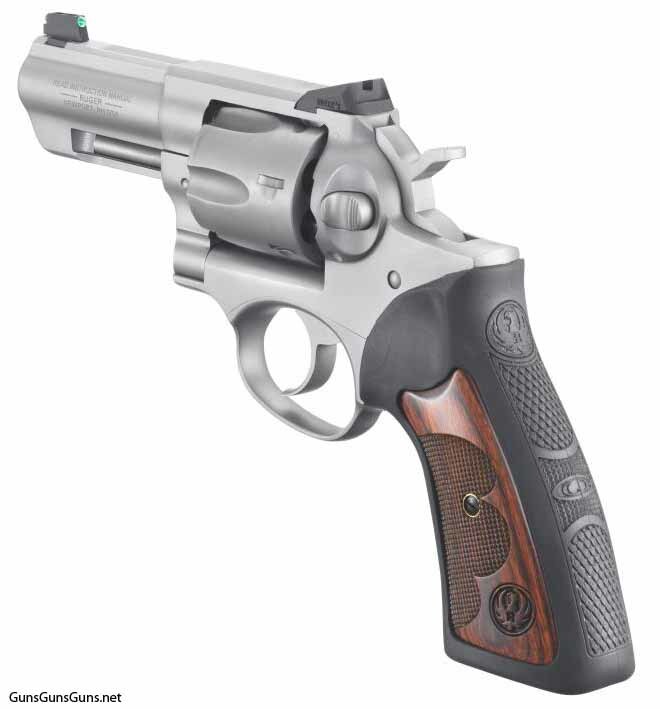 For a fighting revolver, the GP100 Wiley Clapp has it all: a hand-filling, recoil-controlling grip; fast-acquisition sights; a smooth trigger action; rounded edges; and a powerful chambering. What more could you want? You might say “smaller,” but then you wouldn’t want to practice with it, especially with full-power magnum ammo, and we all realize the importance of practice when your life might be on the line. With a proper holster and belt, you can easily carry and conceal this revolver, and let’s be honest: If you’re fighting for your life or the life of a loved one, don’t you really want a full-powered handful of gun? Dave Spaulding is a 28-year law-enforcement veteran, retiring at the rank of lieutenant. He’s worked in all facets of law enforcement—corrections, communications, patrol, evidence collection, investigations, undercover operations, training and SWAT. He currently operates Handgun Combatives, a handgun-combat training program, and he’s authored more than 800 articles for various firearm and law enforcement periodicals. In 2010 Spaulding received the Law Officer Trainer of the Year award, and he’s also the author of the best-selling books Defensive Living and Handgun Combatives. .38 Special, .38 Special +P, .357 Magnum 6 3″ 8.5″ 5.57″ n/a 36 oz. This entry was posted in .357 Magnum, .38 Special, .38 Special +P, $501-$750, $751-$1,000, Full size, Revolver, Ruger, Talo and tagged Handgun Reviews on September 17, 2012 by Dave Spaulding. I am a man of 70 yrs. Was a Police officer and Deputy Sheriff for 26 yrs. I have had the opportunity to shoot several handguns in Semi-auto, single shot pistols and double action revolvers. I reviewed the GP100 on the internet and then bought a brand new GP100 with a 4.2 inch barrel. I have now shot two 50 round boxes of .357 magnums and a 50 round box of .38 Specials. The Ruger GP100 is a dream to shoot. Much better than I thought. I love the double action. Smooth with a click that lets you know you are about to fire the round but like the single action it is still a surprise when it goes off. I love this gun!!! I have a ruger gp100 1 of 2000. it has a three inch barrel talo edition. I have never fired the gun. it is the hawkeye finish. I love the feel of the gun. it is a 357 /38 +p loads. the ruger gp100 is a fine gun. it is one of 2000. I haven’t shot it yet. it has the hawkeye finsh and 3 inch barrel. I am 66 years old . I have 2 Wiley Clapp GP 100’s with 3″ barrel I am 67 and want to be sure I have one of these for the rest of my life. I have one with standard beautiful functional grips and one with regular 4″ up grips also very nice for larger hands. They are very natural pointers which you can’t always say for beefier revolvers ! ?